A comment on a previous post says Because WebClient has a dependency on a web server running, the version I wrote won't be added as a project template into Deep Zoom Composer, which sounds like a shame and got me wondering how to get around the 'WebClient' problem. but you can't do that if you Silverlight control is hosted in a web page off your local disk! It turned out to be pretty easy to get around - firstly here's a screenshot: the page has simply been double-clicked off the hard-drive, yet it is still able to load *some metadata* to enable tagging & description display. 2) Tag Generator saves "Metadata.xml.js"
3) Html page references "Metadata.xml.js"
6) Update xmlClient_DownloadStringCompleted to walk the JSON object array instead of Xml, and the rest of the code 'just works'! Hi Craig. Your blog has been a great help! Thanks for that. I am trying to take the information from your post and from Kirupa's sample project to create some additional functionality, but I seem to have hit a hurdle. It appears I need to use URI to resolve this error. Only problem is I am new to all of this and do not know how to hook that up. Any advice would be appreciated. Thanks! 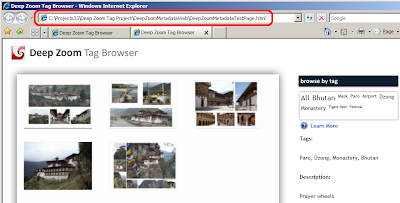 A quick google for "silverlight image source converter" turned up this post How to set image source on silverlight.net forums. I've not tried it, hope it works. p.s. I assume ImagePath is a new attribute you've added to the metadata? DZ Composer includes a <Filename> tag but it is the image location on your local disk and won't work for your scenario (but I think you already knew that). Thanks Craig. Yes, ImagePath is a new attribute. I tried the URI code and recieved an error reading, "Cannot implicitly convert 'System.Uri" to "System.Windows.Media.ImageSource'". 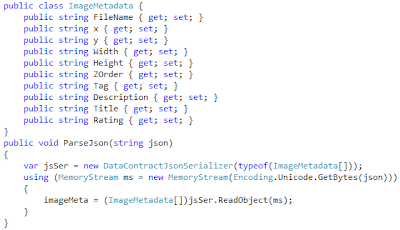 If only the image names listed in this XML file could populate the image control as easy as the text string data populates text boxes, this would be so simple.